No. 8M, the alpha male with the Rose Creek pack was found dead by researchers on July 4th, underwater and pinned beneath a log in Slough Creek. Researchers were able to locate him by tracking the mortality signal emitted by his radio collar. The exact cause of death is pending necropsy results which should be published in the next week. The probable cause of death is speculated to be natural. No. 8 came to the Rose Creek pack as a young dispersal from the newly released Crystal Creek pack in 1995 while famous #9F and her newly born 8 pups were being held a second time in the Rose Creek acclimation pen soon after #10M, the father of the 8 pups was killed by Chad McKittrick in April 1995 near Red Lodge, Mt. Some of you may remember that in October of 95 several tree’s fell across the acclimation pen during a wind storm, which opened it slightly just large enough for pups to exit. It was feared that coyotes would kill the pups, but #8 showed up and adopted them, protecting them from coyotes and other predators until a few weeks later when #9 and the remaining pups were released. Ray Paunovich captured the pack on film following the release several times and I often use some of the footage in my classes. In one sequence it appears that #9 was teaching #8 how to be an alpha male as they ran off one of #8’s brothers. No. 8M was originally captured up near Hinton, Alberta as a sub adult with the Petite Lake pack, and had a great life in Yellowstone roaming the northern range of the park. He spent most of it up in the Little America/ Slough Creek area and on over to the west in Hellroaring. Some of the nicest area of Yellowstone, and perfect wolf habitat. His genes will live on for many years. He bred not only #9, but 9’s daughters #18, and possibly #19 as well. No. 18 is now considered the official alpha female, now that her mother #9 left, or was driven from the pack this past winter. 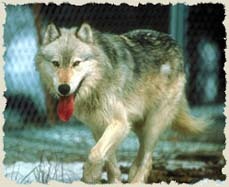 It is unknown yet how many pups were born this year, or what effect the death of #8 will have on the Rose Creek pack.